Local of Itanagar demanding for banning of bathing and picnic near intake point of Water Treatment plant in Senki river at senki view point. 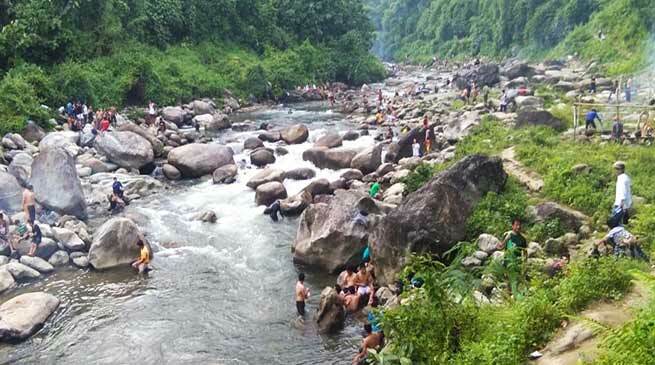 The denizens of Itanagar township are demanding for total ban of bathing, picnic, merry making and washing cloth near intake point of Water treatment plant (WTP) in Senki river. The locals of the Itanagar complaint that the capital administration is not listening this sensitive and serious issue, despite the fact that several youths have lost their lives when they come to enjoy for bath and picnic etc. Because this location is intake of water treatment plant, the water gets contaminated with the use of soap, shampoo for bathing or washing cloth which would be adverse affect on the health and life of locals of Itanagar, they observed. Locals said that though PHED department might clean the water but it is a matter of great concern, we are using the contaminating water which may be dangerous for our health which raise several question. Senki View Welfare committee allege that “we have approached with the Capital Deputy Commissioner on several occasion but in vain even to PHED Department but the result is nill”. Locals informed that the PHE department have also wrote to the capital district administration for providing security or patrolling in the area for safety and security of the people and guarding of WTP but could not be materialised and the reason may be best known to the PHED and Capital district administration. It must be mention here that several precious life of youths have been lost in the area in Senki river during late night picnic and also unwanted elements venturing at the river side causing accident have taken place. It have also been observed that boys and girls in school uniform also visit the river bank and take bath and use alcohol, On several occasion there have been a situation of argument and manhandling with locals. Due to huge rush of youths there have been a problems for parking of hundreds of vehicle and the locals have to face the problems due to haphazard parking in the area. Several instances of problems have been reported from the riverside and riverbank during day and even in night and the matter is known to the capital administration and local police station. However earlier an order was passed for banning of open bath, washing cloth causing which water gets dirty near WTP by then DC Mige Kamki and the SWC was authorised to take care. Another order was also issued for safety of WTP and youths from downing and protection of Intake point by then ADM Talo Potom , but the order have never been implemented. SWC President Kipa Loglo informed that last year also the same issue in the media but the administration still silent. A local resident of Senki View Tana Tagi Tara while said that a time will come when all the parents have to come to Senki View if their wards do not reached to their home as the many school going children are also involved in picnic without going to school. During night youths are seen loitering in the colony and are detrimental for law and order problem in the area. The capital district administration and capital police have to see the genuine grievance for the area and the drinking water plant which is being contaminating by the bathing of hundreds of people at its upper ridge. PHED Executive Engineer, Itanagar Division Tadar Mangku when contacted said that the matter have been processed since last year and the Capital district administration have agreed to provide private security , but yet to prepare the financial modalities. No doubt the situation is grim and a day will come when we could would not be able to handle the situation if immediate arrangement is not made, said Tadar. DC Capital Prince Dhawan while said that he is also aware of the situation and there is immediate need for providing of security. The capital district administration is going to provide private security of Ex-servicemen, but due to some technical reason the matter was delayed for month together and now it have been resolved and very soon security would be provided which would take around a week or two. SP Capital however said that he would send a team of police officer at the site to take stock of situation and would also provide patrolling until the issue is resolved immediately.